Got Talent? or maybe not? All the gear and no idea? our trackday addicts exclusive t-shirt features the slogan on the front and the TRACKDAY ADDICTS logo on the rear. 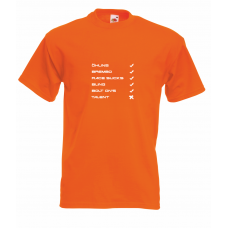 Use our product selection boxes to choose your size, T-shirt colour and print colour. All our T-shirts are produced to order using heavyweight classic fit T-Shirts, most popular sizes and colours are produced and ready for dispatch the same day, although some colours and sizes can take up to 14 days for delivery. We will notify you if there is any likelihood of your order being delayed.